A week before the Ultra Trail du Mont Blanc (UTMB) I heard a quote on the TV. I wasn’t really listening but I thought it was someone making a tongue-in-cheek reference to how to successfully read a book: ‘you start at the beginning, you keep going to the end and then you stop’. A week later I realised that this also perfectly sums up an Ultra race. The quote had become my mantra as I laboured my way round the Tour du Mont Blanc trail taken by the Mont Blanc Ultra race, in the last weekend of August 2008. This is one long race and it should never be undertaken lightly. For those of you still working in feet, 9400m is 30,832ft! 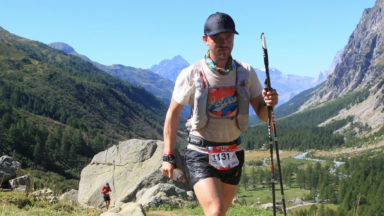 I had already completed the UTMB in 2006, thinking I had done fairly well in terms of the competition, when it was ‘only’ 158km and 8400m of up and down. I’d had a blast and at the time I thought that was it, that I would not be doing the race again. That remained my opinion until a year later, when I was guiding the Tour of Mont Blanc in the week leading up to the 2007 race. The banners were everywhere, people kept asking me if I was running it again and then, to cap it all, I saw the runners’ lights high up in the mountains as I drove off to my next trek in Austria. I knew then: either don’t be here for the race in future, or do it again. Of course the former idea was perfectly possible; I could always plan a trek elsewhere and so be totally oblivious to what was going on here. But that latter little worm of an idea had got inside me, and it grew. By late autumn I knew I would be applying for a place for the 2008 UTMB. Signing up was a marathon in itself. The sign-up was one evening in early January. At 9pm the website opened and 15 minutes later the UTMB 2008 was full. 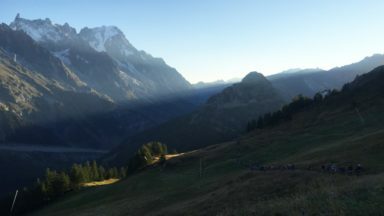 My computer balked and I couldn’t get online – luckily a friend in nearby Switzerland came to the rescue and we did the whole thing with me quoting details to him over the phone. Afterwards we were both shaking with excitement (or, in my case, fear). Then came the long months of training. 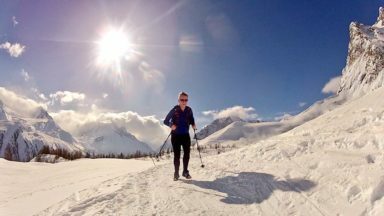 Because I work in the mountains my training is never textbook – I have to run when and where I can, and sometimes that can be just an hour in the early morning before going out with clients. There were many, many occasions when I was up at 5am pounding the streets in winter (and the verglas can be quite exciting round here, not to mention the snow) and then as the summer came I was rewarded with dawn runs on high trails, getting back to huts just as everyone else got up and we all were soon to head out for a day’s trekking. There is always fear – that you’ll get sick, that you’ll get injured, that you just won’t get to the start line in good shape. And of course there were plenty of scares: worn-out legs at the end of the winter season, severe diarrhoea in Morocco in May, a dislocated rib two weeks before race day… the chances of watching this dream go up in smoke seemed to be many, and I rode a real roller coaster of highs and lows in the weeks preceding the race. But finally there I was: 29 August, 6.30pm, in Chamonix and ready to go! The organisers really know how to put on a performance and we were treated to many repetitions of Vangelis’ Conquest of the Paradise at the start line – it played louder and louder each time until the ground under my feet was vibrating. The forecast was good and the sun was beginning to set on Mont Blanc as we finally took off, at a snail’s pace, down the main street in Chamonix. My friends and Jon were there in the crowd, bearing a banner to cheer me on. My overwhelming emotion was gratitude – that I had made it to the start in good health and that I had a place in the field. I was determined that this would be my last time taking part, but for this reason I was going to savour the experience the whole way. There are lots of people who did not get places, and also folk who had to drop out due to injuries suffered during preparation. There are also many people who do not have able bodies for this sort of challenge. It was going to hurt, but I considered myself awfully lucky to be able to participate. 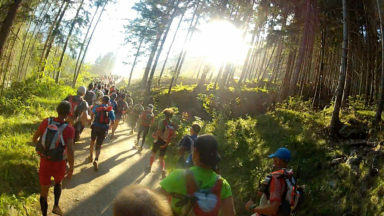 The music was still ringing in my ears as we left the outskirts of town and headed down to Les Houches, with plenty of jostling going on between all 2300 runners who had signed up. The evening turned out to be really humid – to my surprise my clothes were soaking by the time we reached the first pass at the Col de Voza. Behind us the Mont Blanc massif was bathed in soft pink alpenglow. Headlights went on and we turned down the very steep and not terribly pleasant descent to St Gervais. 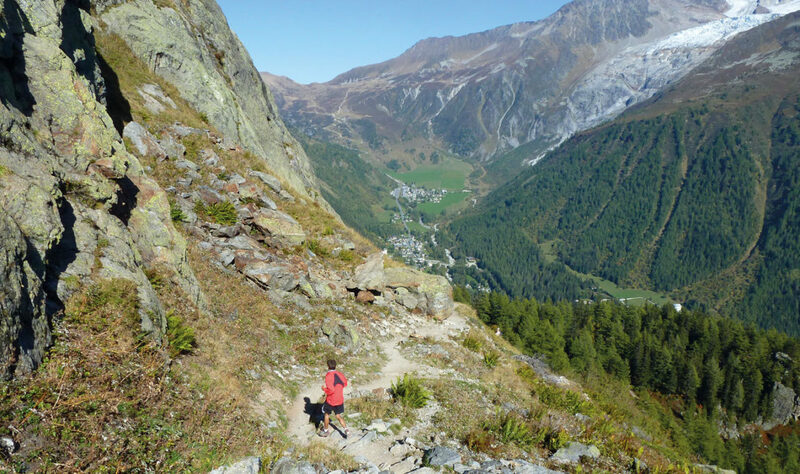 This was a new section for me and I was glad I hadn’t bothered checking it out beforehand – one time down that slippery slope was definitely enough, dodging other runners’ elbows and sticks all the while. The ambience at St Gervais was as good as anywhere else on the race, where revellers’ music and dancing created a real celebration that gave us runners courage to carry on into the dark night. We quietened down notably as we continued up to Les Contamines. I guess we were all now realising just what we’d got ourselves into. The last time I did this race I was somewhat alarmed at around this stage to realise that in 24 hours I would still be doing exactly the same thing! This time I let that thought slip by and consoled myself with the fact that in 40 hours I would be done, whatever the outcome. 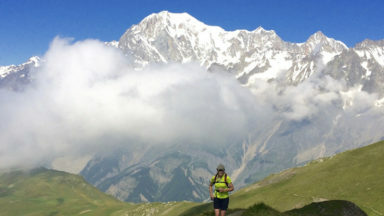 It is quite sobering to think of all the things you do in 40 hours – including going to bed twice – and for all that time most of us were running or walking or staggering along, keeping Mont Blanc on our left, to get back to Chamonix – and all for a T-shirt! We began to climb higher and the air became cooler, but the temperature during the first night was perfect – I was able to remain in shorts and just add an extra shirt. The night was stunningly beautiful, the stars out in all their glory. Looking back from time to time as we climbed up to the Col de Bonhomme and then the Col de la Croix de Bonhomme, I was so excited to see an endless line of lights weaving along behind me. Don’t get the wrong idea – there were at least as many lights in front of me, I just couldn’t see them the same way! On the descent to Les Chapieux I had a real scare when something ‘went’ in my ankle – an old climbing injury that had flared up earlier during the week. I honestly thought I might be in trouble. As far as I’m concerned, quitting is not an option – but I am not superhuman and if I had a real injury I might have had no control over the outcome. I limped into Les Chapieux, worried but determined. Thankfully, the way onward from Les Chapieux is along a road and this proved to be comfortable. The following long climb up to the Col de la Seigne and the Italian border was no problem either, and I ran down to the next big aid station feeling cautiously optimistic. From here onwards there were to be no cups provided at aid stations so as to reduce litter and also so as to use less ‘stuff’. We had been given a huge cup to attach to our rucksacks but luckily an American guardian angel had managed to find a really cool folding cup for me instead, which fit perfectly into the pocket of my shorts. I was surprised to find quite a lot of other runners had this cup too – obviously this was the business. The sun was rising, just kissing the summit of Mont Blanc, as I set off up towards the Col Chécrouit. This is such a beautiful viewpoint, and I was reminded of the last time I was here with a group hiking the TMB, when we had thick fog and couldn’t see a thing! I imagined all the people who would be setting out from high huts in the glaciated mountains, to ascend Mont Blanc and other peaks. Col Chécrouit provided a great spectacle, with belly dancers to encourage us on our way! 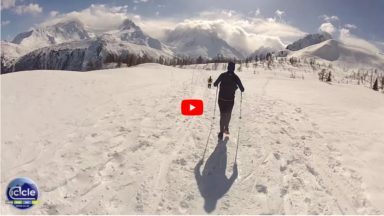 Unexpected encounters with friends gave me a bigger buzz, and sent me flying down to Courmayeur. I felt great! My friends plied me with food, everything was on course and I rolled off through town on a high. This positivity lasted all the way past Rifugio Bertone and on to Rifugio Bonatti, my second home in the winter, where I had time to say ‘hi’ to the guardians before they shooed me out. I trotted along and soon got down to Arnuva. I was going well, really happy and eating well too. However, the next climb up was really odd – I met an acquaintance who was really negative and announced we should both drop out, whereupon I told him in no uncertain terms to keep going! You start at the beginning, you keep going to the end and then you stop. Many people seemed to succumb to the heat on this ascent to the Grand Col Ferret. There seemed to be very few runners, no spectators and I began to wonder what on earth was going on. I think the heat made many runners ill and I am told that in the space of three hours during the afternoon 800 runners dropped out. I called my friends, who were at La Fouly, and they reassured me that I was doing fine time-wise and that everything was OK. I was not considering dropping out; there just seemed to be an aura of negativity on this section. I got myself together again at the col and headed off into Switzerland, my only concern being where I would find a water fill-up spot, but this soon materialised at a farm on the way down. We were then directed onto a longer version of the usual TMB into the village of La Fouly. My mate Jane met me 1km before the aid station and trotted along at my side, her handbag swinging. 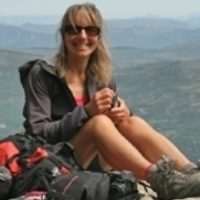 Jane is my Official Manager and she had had to put up with what must have seemed an endless stream of emails detailing the latest little pain, injury and worry – she must have wondered at times whether she’d backed the wrong horse! The evening brought cooler conditions again and I soon embarked on the ascent to Champex. Here I enjoyed an ‘awesome hour of power’, steaming past people on the long forest climb, and I blasted into the aid station feeling amazingly strong. Of course, I should have known it wouldn’t last. With every high comes a low and this certainly proved true as I was slowly but surely overcome with nausea on the next climb up to Bovine. I just felt weird really, not able to go at my usual strong speed on the climb. I was careful and slowed down but every step felt wrong and it was here that I got the blisters that were to test my pain tolerance for the rest of the race. I also began to feel very sleepy and, by the time I met Jon and various other friends at the Col de la Forclaz, I was struggling to stay awake. Trient provided some fun – there seemed to be some sort of away trip going on there for the Vallorcine men, which involved huge amounts of drinking. For me the treats were soup and potatoes, and clean socks. I knew there were just two major climbs and descents left and, as everyone kept telling me, I had loads of time (the cut off time is 46 hours) but I did not want to stop and sleep. I reached and passed Les Tseppes with no problems and friends were manning the aid station at La Catogne. I asked for a coffee in the hope that it would help to wake me up, and it did the trick initially but I was dozy again after only five minutes. In the periphery of my headlamp I would see people collapsed by the trail, who had just fallen asleep. I did not want this to be me and I tried everything to stay awake including singing (luckily there weren’t many other people around but I did encounter a woman being sick – now I know my singing is bad, but still…) Anyway, my efforts to wake up didn’t work and by the time I wobbled into Vallorcine (my home village) I knew I’d have to lie down as I felt it was too dangerous to go on. All the beds for runners were taken. It’s amazing, I didn’t realise there were sleeping rooms at the aid stations – this one looked like one of those hospital camps for injured soldiers you see in war films. So I got into our van and lay down. I was sure I would just fall asleep and had given Jon strict instructions to wake me after 30 minutes. But 20 minutes later I had not slept and the nausea had gone. Reassured that I was not going to keel over and fall to certain death from the trail, I felt ready to go. Friends were cheering me on at the Col des Montets and from there I made a steady pace up the next climb, which was new to the race this year. There were some very disorientated people on the trail – some staggering, some just sitting. One asked me where was the Grand Col Ferret, which we’d passed hours ago in Switzerland. There were no supporters as there is no easy access – the only spectators were ibex grazing by the path. It was dawn again and the sky went red; rain was forecast for later in the day. Now it was just a question of keeping going. I was fine except for the blisters, but on the climb these did not present too much of a problem. 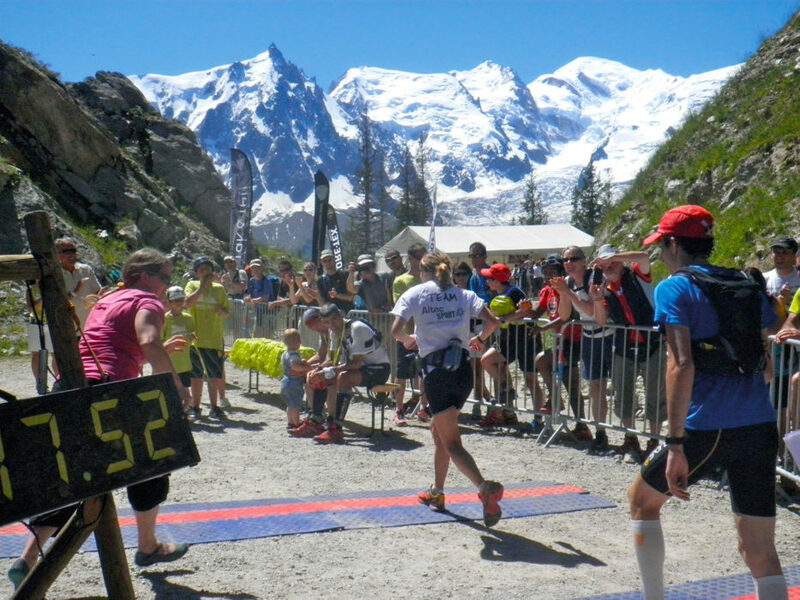 However, from La Flégère to Chamonix there is a very long and rocky descent, which is not pleasant when you’re fresh let alone after nearly 40 hours of racing with open wounds on both feet. Jane and Charles made a brief appearance, taking the cable car up to La Flégère and they were able to brandish their final banner: ‘Head up H you’re nearly there’. Well, yes, I thought, apart from this darned descent. I tried to block out the cable car as it swung them back down to Chamonix in a matter of minutes. I gritted my teeth – a lot, for a very long time. Many people passed me. I feebly muttered about my blisters and just kept going. It was truly a horrible descent and I dug extremely deep down into my reserves of determination just to keep going. But I would never quit – even though the descent brought tears to my eyes. You start at the beginning, you keep going to the end and then you stop. I knew Jon was waiting at the bottom, where we were to arrive into town, and I kept thinking it must be just around the next bend. I lost loads of time here but there was nothing to be done about catching up – each step was agony. Near the end I felt one blister enlarge right up my ankle. Then I was on tarmac, meaning there wasn’t far to go now. Then Jon was running down the road with me, because I could run again now I was on level ground. Barriers alongside the road channelled us to the finish; it no longer hurt and I knew exactly what to do. I’d been through it enough times in my dreams: keep running, get your poles in one hand, raise your other hand in victory and smile! I was the only one in my own personal race, and I had made it for the second and last time! So that’s how it was in the middle of the pack. I have no idea what it was like up front. The winner surprised everyone – a 22-year-old Spaniard, a very talented ski alpinist called Kilian Jornet. He finished in 20hrs 56mins 59secs, which was a record on previous years and which was even more impressive as this year the course had been made longer and harder. In second place was a local, Dawa Sherpa in 21hrs 56mins 52secs. The fastest woman was Brit Lizzy Hawker in 25hrs 19mins 41secs, followed by Frenchwoman Karine Herry in 27hrs 38mins 55secs. I completed the race in 38hrs 39mins and placed 426th out of 2300 starters, 1265 of whom finished it. I was the 22nd woman and eighth in my category. To finish this race is to win – it is extremely difficult and many people drop out. This year about 50% dropped out, including big names from the US, France and Italy – do these people only continue if they think they’re going to win? This is not the spirit of the Ultra but I guess maybe they have to keep themselves healthy for future races. I know many people like me dropped out because of the heat, or because it was much harder than they expected, or they got timed out, but there were also lots of other people who just kept going, never considering quitting and who finally experienced the relief, sense of achievement and utter joy at making it to the finish. That’s what the ultra is: start at the beginning, keep going to the end and then stop. And be very proud of yourself. Without the support I had, my race would have been very different – maybe I would have made it, but one big reason to do this race again was for the friendship it inspires. So thanks to Jane and Charles (the best supporters ever), Carol (who supplied cups and other support), and to Fred, Guido, Jean-Luc, Guillaume and all those people who emailed and texted me, who I knew were supporting me all the way. And to Jon – for accepting this second time around, and for making sure I did not let myself down.